The following games are featured today! 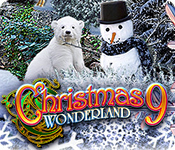 In Christmas Wonderland 9 you visit Santa’s workshop, decorate the house, visit grandparents open presents and more. Have the best Christmas ever!